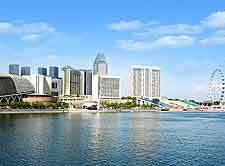 Located just off the foot of the Malay Peninsula and on the southern side of the Republic of Singapore is Singapore City, the island's Downtown Core. This city-state is one of the flashiest tourist destinations in Asia and has much to offer on the tourism front. It is loaded with special attractions, such as a characterful Colonial District, a colourful Chinatown, and many remnants of the days of British rule, as well as boasting some of the best shopping in the world. The eating is also first class, while the high level of accommodation in hotels and the quality of local transport are also world-beaters. For tourist information, the STB (Singapore Tourism Board) has visitor centres all over, including in the airport, on Orchard Road and in Little India. 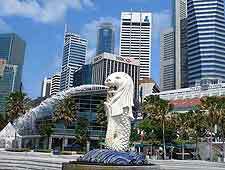 You can easily arrive in Singapore without much of an itinerary and find more than enough to fill an entire holiday. The city is home to many world-class sightseeing opportunities. Worth considering is a ride on the largest observation wheel in existence - the Singapore Flyer, which revolves slowly and offers views as far as the eye can see. And perhaps follow this with a trip to the Little India neighbourhood for lunch and a spot of quirky sightseeing, and then be sure to take a shopping expedition along Orchard Road, where designer labels are in abundance. 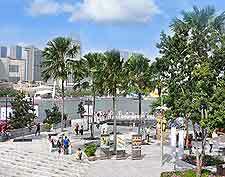 More information about Singapore City Tourist Attractions. Many of the most important and imposing buildings in Singapore City reside within the Colonial District, and this is where you will find landmarks such as the Parliament House, an old government building dating back almost 200 years. Also in the city and of historical interest is Fort Canning, which stands atop a small hill close to Orchard Road and features an important archaeological excavation site, Gothic gates, a Spice Garden, memorials, a pair of large cannons and a battery of guns. The adjacent Fort Canning Green provides a popular recreational space, regularly used to host local open-air concerts, and in the past has staged the successful WOMAD festival (World of Music, Arts and Dance). The riverfront adds much character to Singapore City and the Boat Quay, Clarke Quay and Robertson Quay are all vibrant places to hang out. 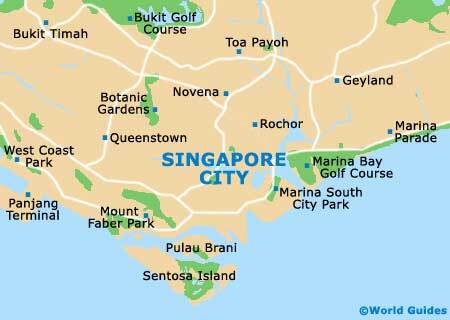 More information about Singapore City Landmarks and Monuments. Culture is rich in Singapore and the city contains the country's principal museums, historic information and heritage collections. Close to Fort Canning is the National Museum, where the island's extensive Asian history is displayed for all to see. Just a short stroll to the south, passing the Supreme Court, the Victoria Concert Hall and the Cricket Club is the Asian Civilisations Museum, a riverside attraction with a majestic neoclassical facade and some fascinating local treasures. Located on the western side of the city is the Science Centre, where an endless array of interactive goodies will keep children entertained for hours. For a spot of serious art appreciation, head to the Singapore Art Museum (SAM), where more than a dozen galleries showcase thousands of art works. 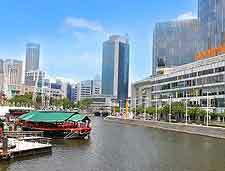 More information about Singapore City Museums and Singapore City Art Galleries. 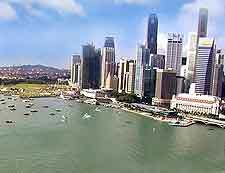 Tourists based in Singapore City will discover a good choice of day trips and surrounding places of interest. Families generally head to Singapore Zoo, which is regarded as an exceptional zoological attraction and contains all of the typical exotic creatures that you would expect. However, the unusual thing at the zoo is the 'Night Safari', when guided trams give you an insight of how the animals behave after hours. Excursions to the Bukit Timah Nature Reserve, the Jurong Bird Park and the East Coast Park are all highly recommended, while for many, the Singaporean coastline beckons. Hugely popular and within easy reach of Singapore is Sentosa Island, where highlights include the Underwater World and Dolphin Lagoon, the Tiger Sky Tower, and a good choice of tropical beaches backed with palm trees. 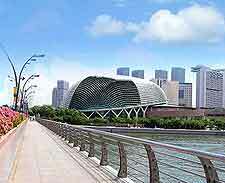 More information about Singapore City Attractions Nearby.